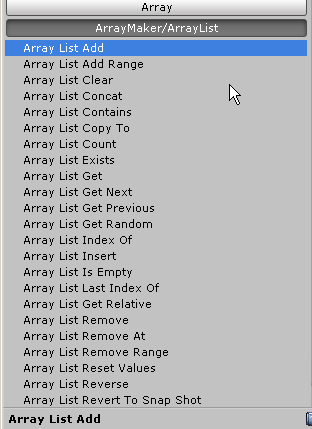 I hope they are useful to someone None of them use any third party scripts and all the array actions use Playmaker native arrays. I've really come to love coding even though I'm just a beginner- I've made a ton of Playmaker actions recently- I'll put them online/organize/share them soon as I'm sure some of them would be useful to others. Playmaker Help / Re: Get vector towards another object? Try unchecking "Auto refresh action usage"
This action is meant to be used on an Npc to knock it back when its damaged/hit- it works with Npc's that use NavmeshAgent, RigidBody, or CharacterControllers for movement. Just choose the one you want in the popup. It will knock the Npc back in the direction of what it was hit by. On your projectile or melee weapon- use a cast(raycast, spherecast, etc)- get the hitpoint from the cast and pass it to this action through the "HitPoint" var and the action will do the rest. Playmaker Help / Re: How to create gears for a boat with Playmaker ? So for setting your speed float- whenever you set it- multiply it by another float that will act as a multiplier- then you just change the multiplier to set the different speeds- you can change the multiplier float from within that FSM or outside of it as well. Attached the script since snipt is no longer. Playmaker Help / Re: Arraymaker. All Array action are NONE and cannot be changed. By "clip" do you mean they go through the geometry? I've been working on an action 3d platformer for some time now and yes, its quite a challenge!